Traveling 10.82 miles across central Pinellas County, State Road 686 links the city of Largo with St. Pete-Clearwater International Airport (PIE), Feather Sound and north St. Petersburg. The entire route consists of multi-lane arterial, with interchanges at U.S. 19, CR 611 (49th Street North), both ends of the overlap with SR 686 (Ulmerton Road) and Interstate 275. Additionally work completed in early 2018 at the east end of SR 686, where Roosevelt Boulevard ties into SR 694 (Gandy Boulevard) by U.S. 92 (4th Street North), elevated Gandy Boulevard onto a freeway with SR 686 tieing into the new frontage road system. The $337-million Gateway Express project involves the construction of a two-prong elevated toll road. The State Road 686 branch will run north to connect I-275 with St. Pete-Clearwater International Airport (PIE) and CR 611 (49th Street North) ahead of the Bayside Bridge. The State Road 690 branch supersedes CR 296 (Bryan Dairy Road) west from I-275 to U.S. 19 in Pinellas Park. The new alignment for SR 686 takes the route north from Bryan Dairy Road between 44th and 40th Streets North to the current interchange at the SR 686 / 688 west split. The Gateway Express will then overlay Roosevelt Boulevard northward to the airport and diamond interchange with 49th Street North. The SR 690 portion follows the existing right of way along CR 296 (Bryan Dairy Road) west to U.S. 19, where a new set of flyovers will form a wye with U.S. 19 north and from U.S. 19 south. 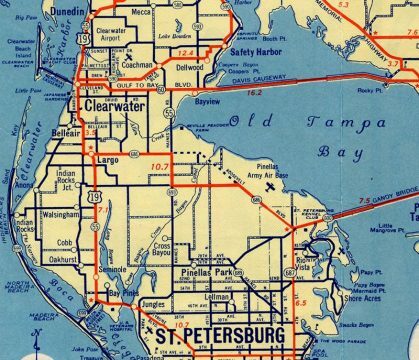 This 1948 inset of Tampa Bay shows that before Roosevelt Boulevard was built between Ulmerton Road (SR 688) and U.S. 19, State Road 686 traveled Ulmerton Road west to then Haines Road north in an L-shaped route. SR 686 sign bridge posted on the Airport Parkway exit to St. Petersburg-Clearwater International Airport (PIE). This overhead was replaced by 2015. The blue sign replacement no longer references SR 686 and instead directs motorists to I-275 and U.S. 19. Photo taken 11/22/07. Florida 686 (Roosevelt Boulevard) links the terminal with Largo, Clearwater (via CR 611 & U.S. 19 north), and the coast. SR 686 east connects with SR 688 to Interstate 275 for Tampa and St. Petersburg. Photo taken 01/03/15. "Pinellas&apos; &apos;Gateway Express&apos; road project nears two milestones." The Tampa Tribune, March 4, 2015. "2 more years of construction ahead for east end of Ulmerton Rd." Bay News 9, March 31, 2014.